Although Longhaired Cats are traditionally associated with the show ring, non-pedigree Longhairs grace many a home and hearth. Like the more common non-pedigree Shorthair, they should not be thought of as somehow “second best” to the refined show specimen – they may not have the same illustrious parentage, but they still have the same, innate, feline appeal. Longhaired Cats probably arose as the result of a spontaneous mutation within an isolated, perhaps cold, region that enabled the feature to be perpetuated through interbreeding. The modern Longhair is mostly descended from Turkish and Persian cats brought to Britain during the late nineteenth century. Non-pedigree Longhairs can be the result either of crossbreeding Longhairs or of matings between longhaired cats and shorthaired cats. 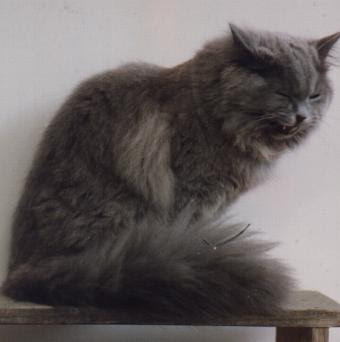 Like all cats, the non-pedigree Longhair has a personality uniquely its own, formed by heredity, upbringing, and social environment, but is nonetheless likely to be more docile than its shorthaired relation. As you would expect, a limitless number of “varieties” are possible for the non-pedigree Longhair! As with the non-pedigree Shorthair, the cross-bred Longhair is more likely to have tabby markings than any other because they comprise the basic feline coat pattern. The length of the fur tends to make the markings less evident, but a Tabby is nevertheless always unmistakable. -Medium in size, round, with a medium-length nose and red nose pad. Medium in length and thick. The paws are large and round. An indefinable color, but still a most resplendent cat!